This work titled ‘Lily Pond’ is very close to the artist’s heart. It was conceived in Auroville, Pondicherry as part of an academic-program building. The school has a tailoring department that became the stimulus behind this work for artist Nidhi Khurana. This work entailed working with untrained children. The work was bringing to fruition a mural, taking cue from lily ponds. Lily ponds form part of an essential motif in Pondicherry. Every place is strewn with lily ponds. Therefore it became emblematic in terms of assuming a visual subject reference for the students. 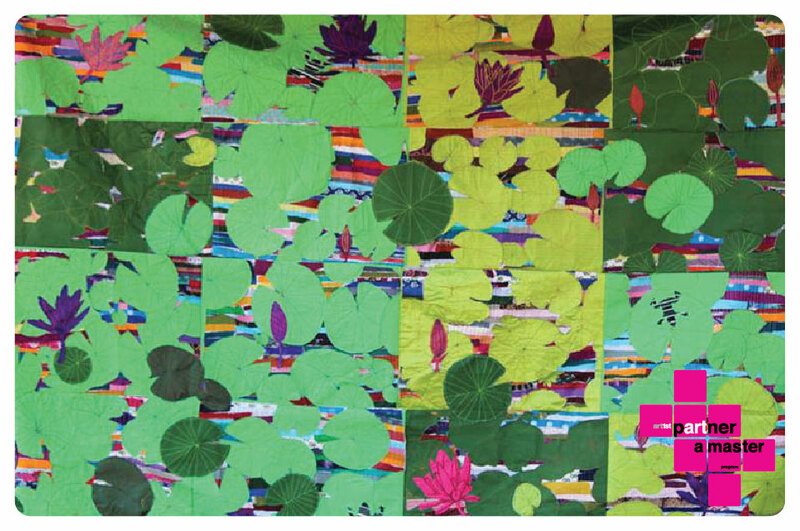 All the elements that are found in a lily pond– mud, water, frogs, dragonflies, lotus, leaves and the like were incorporated as part of the final mural.